Water is Life. It is a statement that we have all heard but are able to appreciate even more following the devastating drought conditions that we have experienced throughout South Africa. A sustainable water supply is essential for human health and hygiene and production of food. Every drop of water must count! We have seen that water issues know no boundaries and impact on everyone regardless of race, gender or class. However, we are aware that a greater burden is placed on women as the primary provider of the needs of a family. The role of women in the rural areas as the primary water collectors is well known. This activity limits the productive activity of women and excludes them from income generating opportunities and threatens their health and well-being. Illness as a result of using contaminated water not only places the women at risk but increases the work burden when required to take care of family members who fall ill. Agricultural practises to provide food for the household supports food security but increases the demand for water. Girls are also impacted on poor water and sanitation availability and often do not attend school during menstruation due to a lack of facilities. We may think that this burden does not exist in the urban environment. We can always access water when we open the tap and have flush toilets. While urbanisation does offer benefits, urban poverty still impacts on women and girls due to poor sanitation and inadequate access to clean water. In addition, there are limited opportunities to grow food for the family. The challenges faced by the women in our country impacts on us all. With the current challenges of meeting water demand and the challenges experienced by many households, we have all been forced to reflect on our relationship with water and how this precious resource can be used more sustainably. In the presence of adversity, opportunities have been realised to respond to the challenges through innovation and science. 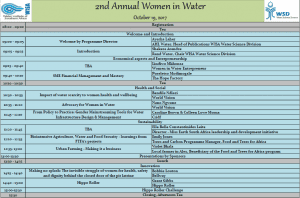 The WISA Water Science Division invites you to the 2nd Annual Women in Water Event, to be held at Indaba Hotel, Fourways, Johannesburg on 19 October 2017. The theme of the event is “Make a Splash” and we invite you to join us in sharing experiences and achievements in the water sector with a specific focus on the responsibility of women, with the aim of an improvement in the social, health and economic aspects of the life of women.